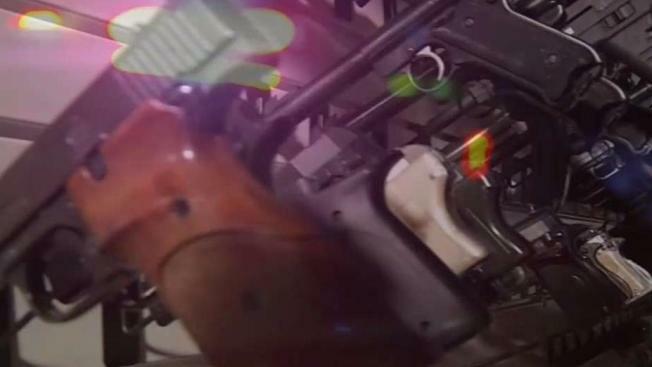 Hundreds of thousands of firearms stolen from legal owners are flowing each year into underground markets -- and the numbers are on the rise. Those weapons, stolen from homes and vehicles, often end up in the hands of people prohibited from having guns. Many are later used to injure and kill. A yearlong investigation by The Trace and more than a dozen NBC TV stations identified more than 23,000 stolen firearms recovered by police between 2010 and 2016. The vast majority of those were connected with crimes. That figure, based on an analysis of police records from hundreds of jurisdictions, includes more than 1,500 carjackings and kidnappings, armed robberies at stores and banks, sexual assaults and murders, and other violent acts in cities from coast to coast. In California, 71,478 guns have been reported lost or stolen since 2010. Since 2010, 55,885 guns have been recovered from crime scenes since 2010 and at least 4,800 of those match the serial number and make of a gun reported stolen. And in that time, more than 60 people have been killed by a stolen gun in California. Data also indicates that 359 guns traveled more than 50 miles from where they were lost or stolen to where they were recovered. It's a public safety threat that police chiefs and sheriffs are struggling to contain. The Trace requested statistics on stolen weapons from the nation's largest police departments in an effort to understand ground-level trends. Of the 1,000 police agenciess that provided at least five years of data, 61 percent recorded per-capita increases in 2015 compared to 2010. Watch the video above for a closer look at gun theft in Southern California. Click here for the full report, Stolen Pieces.